Boat shoes, also referred to as deck shoes, are comfortable slip-on leather or suede shoes with a rubber outsole. Boat shoes can be worn for almost any occasion, casual or smart casual and have become a popular fashion shoe style these days. The Boat Shoe started out as a shoe worn by crews on the deck of a boat, yet today it has become quite popular as a fashionable and comfortable shoe among men and women. The boat shoe simply comprises of a soft high traction, and slip resistant rubber outsole, and a leather or canvas upper, with a slip-on design. Boat shoes have a low below the ankle profile, and are ideal for spring and autumn when it is not too cold, or too warm yet. They usually feature decorative lacing on top, and a very distinct silhouette. You can find Boat shoe in an enormous amount of, colors, materials and designs, available almost anywhere. Ideally Boat shoes are a warmer weather shoe, so again I would say, perfect for springtime or autumn. They can be worn with almost any smart casual, or casual outfit, and for any occasion, though I would not wear them for a complete formal setting. Boat shoes were originally designed for men, but have now become more popular among women as well, so here are a few outfit options to pair your Boat Shoes with, keeping in mind to match colors and styles. Boat shoes look superb with cropped pants or Skinny jeans and a T-shirt or button blouse. Again a pair of Skinny or cropped pants and a blazer will look perfect with your Boat shoes. You can likewise wear a skirt or dress that is casual and comfortable and match them with your Boat shoes. Knee length or very short shorts and a blouse or shirt are likewise a good look. Traditionally Boat or Deck shoes have either, Leather or Canvas uppers, in a dark or mid brown color. Though today you will find them in any color design. The uppers of a boat shoe are treated to Repel water, and to be stain proof. The uppers are similarly hand stitched with decorative stitching details and laces. 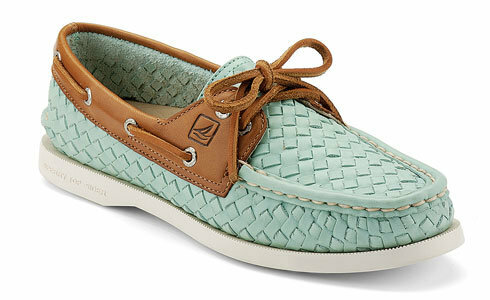 A Boat shoe has a Moc-Toe construction, which is its main style with a three or two eyelet lacing system for decoration. The Sole of a Boat shoe is traditionally made from rubber, as well as being non-marking, and slip resistant, with a herringbone pattern carved into it. There is similarly a shock absorbing heel cup, and a supportive insole. We start of with the absolutely stunning, Sperry Top-Sider that features some unique handcrafted details, and two material types construction. Manufactured from the finest quality 100% leather and natural textile materials. Genuine and meticulously handcrafted and sewn for perfection. The fabric insole absorbs moisture and keeps your feet dry and comfortable. Gorgeous decorative detailing and availability in a vast range of color options. Completely stain and water resistant leather, with sparkle finish panels, for that feminine appeal and extra detail. Extremely durable and long lasting construction and materials, in a good quality shoe. An excellent choice in Boat shoe for walking, the Go Walk from Skechers is designed specifically with comfort and support features for walking, and this model boasts the superb details of a Boat shoe. Two tone Textile and Leather Uppers, available in a Tan and Navy Blue color option, or a light and dark beige color option. Very lightweight and comfortable with a 5 Generation cushioning system which is ideal for impact absorption, while offering cushioned support. Features the Skechers Goga-Max high-rebound insole that offers excellent support. A soft moisture-wicking fabric lining on the inside to keep your feet dry. Beautiful Boat style construction with a white durable rubber outsole, which is shock absorbing and ensures good grip. Clarks is yet another comfort shoe brand that is highly popular and sought after. This Boat shoe features many comfort and support features for every foot type, along with decorative details for a complete feminine Boat Shoe appeal. Complete Textile Upper construction with two-tone complementing colors, and decorative stitching. A durable and thick rubber outsole in white color, that is skid proof and offers excellent traction on all surfaces. Available in a few stunning and funky color options, this one is definitely for the more extravagant lady. Features a highly comfortable and supportive Orthalite footbed and Cloudstepper technology. Super soft cushioning for comfort. Exquisitely finished design and construction. Sperry is one of the Top Boat Shoe manufactures and feature many stunning and highly comfortable models of Boat shoes and slip on shoes. I have chosen the Lounge Away because of its lightweight and breathable materials that are perfect for summertime and hot weather conditions. Stunning soft and breathable Cotton textile uppers that are similarly lightweight and comfortable. A low profile vulcanized rubber outsole is offering excellent traction. The footbed features resilient and highly comfortable memory foam that contours and cradles the shape of your feet. Available in a few pastels and neutral color options for you to choose from, that will complement a light summer outfit very well. The Columbia Delray is a genuine and perfect “BOAT” shoe, which is ideal for wearing on wet surfaces and Boats because of its high grip and comfort design. A durable and high traction Omni-Grip, a non-marking rubber outsole that offers excellent grip on wet surfaces as well as comes with razor siping. The Techlite midsole offers superior cushioning and excellent energy return. A Lower durometer EVA, for even more comfort and shock absorbency. Completely water and stain resistant, treated with Blood and Guts Technology treatment, to keep your feet dry and protected at all times. Combines an open mesh and synthetic textile upper design. Availble in a GRAPHITE, ANCIENT FOSSILE, AND STEAM, color design.